Quick overview Based on the work of the terminology project group of the European Network of Occupational Therapy in Higher Education (ENOTHE), this book selects and defines the core building blocks of occupational therapy theory. Consensus definitions of a wide range of terms are developed through an analysis of published definitions from around the world. The profession of occupational therapy has a highly specialised language, but until now there have been no standard definitions of its key terms. Based on the work of the terminology project group of the European Network of Occupational Therapy in Higher Education (ENOTHE), this book selects and defines the core building blocks of occupational therapy theory. Consensus definitions of a wide range of terms are developed through an analysis of published definitions from around the world. Concepts with similar meanings are clustered into groups, and the clusters are then arranged into a conceptual map. 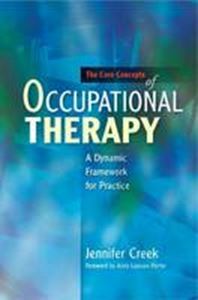 The book provides an analysis of what each term means in common usage, how it is used in occupational therapy, and its implications for therapeutic practice. The conceptual framework that emerges represents an important contribution to the profession's understanding of the fundamental concepts of occupational therapy. The consensus definitions presented in this book will facilitate communication between professionals as well as with clients and others, and will be of interest to occupational therapy practitioners, students, educators and researchers.